This variety has been in the works since the late 1990s when UMN apple breeders David Bedford and Jim Luby set out to develop an apple that would be ready to pick and eat by Labor Day weekend. Can I buy these apples? The new apple is available this fall (you can try one at the State Fair) but supply will be limited. As the trees mature and bear fruit, more apples will be available to Minnesotans. "We're excited for Minnesotans to get their first taste of First Kiss," Jim Luby said. In the future, if you're looking for it in the store out of state, this new apple is being marketed with the name "Rave®" and grown by Stemlit Growers in Wenatchee, Washington. Honeycrisp x 'AA44' Even apples have parents! 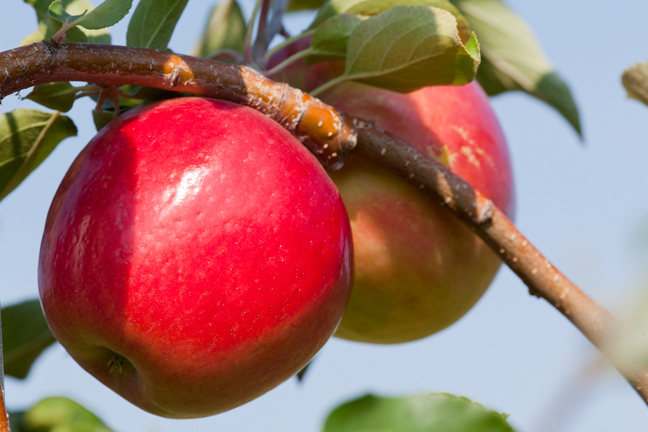 UMN plant breeders carefully cross-pollinated Honeycrisp with 'AA44' from the University of Arkansas. The result? An early season treat with the famous crisp and juicy texture of Honeycrisp! First Kiss is ready to harvest and eat in mid-to-late August. That's up to four weeks earlier than Honeycrisp. First Kiss is #27--the 27th apple released by plant breeders at the University of Minnesota in the program's history! Eighteen of those 27 are still available today, including Honeycrisp. How does it taste? First Kiss features a tart, yet well-balanced flavor...and the texture is crisp and juicy, like a Honeycrisp! First Kiss apples can only be grown by licensed apple orchards in Minnesota. Sorry home gardeners! Researchers at the University of Minnesota have been developing and evaluating apple varieties since 1878. If you'd like to learn more about the U of Mn's apple tree breeding program, take a look at this video and have an apple!